The debate was highly controversial, being widely criticised by student organisations, for the inviting of Islamophobic speakers, such a Steven Gash, formerly of SIOE (Stop the Islamification of Europe). Others invited speakers included renown former Catholic priest, Idris Tawfik, and Muslim public speaker, Abdullah ul Andalusi of the Muslim Debate Initiative. The most shocking moment of the debate, was when Stephen Gash broke his cool and started shouting at the invited speaker, Abdullah al Andalusi during his rebuttal speech against Gash’s ideas, and ignored the moderators pleas for civility and silence. Abdullah continued his rebuttal nonetheless, and Stephan Gash stormed out of the hall in fury mid-debate – to the booing of many attendees who felt that such behaviour is not becoming of the etiquettes of debate. 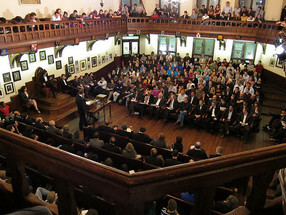 Many felt that the debate title was provocative, while others felt that a platform shouldn’t be given to the far-right (see article here). The shocking conclusion to the debate, caused further stir around a already contentious event, but was seen as a vindication of those who insist that Islamophobia should be positively challenged in such a manner. Does God Exist? & How do we know there is only One God?